Jeff Kulek is an award winning General Manager that has been a passionate hotelier for his entire career. Jeff’s experience includes multi-property management, overseeing the West Coast hotels for Interstate Hotels (including Canada) as well as Morgans Hotel Group. Jeff is on the Board of Directors for Visit West Hollywood and is an active business member in the city of West Hollywood. Jeff is a team oriented leader that believes in instilling a sense of ownership amongst his team that inspires individuals to do their very best at all times. 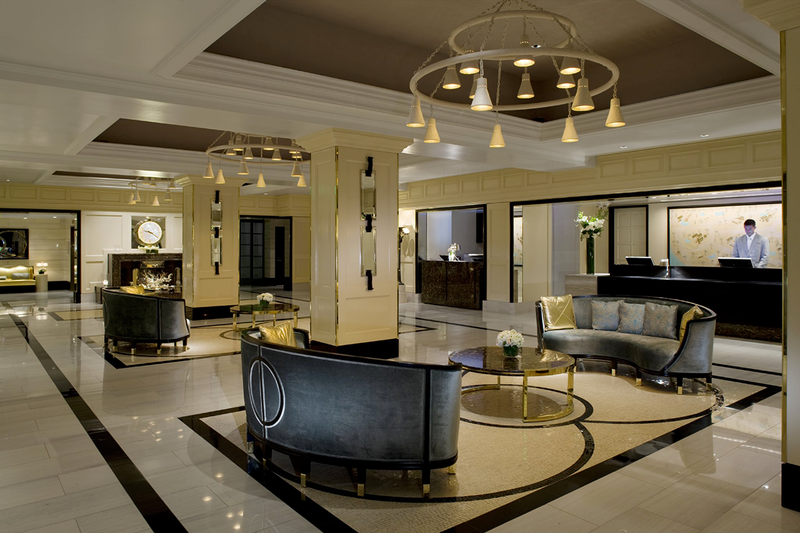 Member of Signature and American Express Fine Hotels & Resorts (FHR). The London West Hollywood at Beverly Hills completed a $27 MIL renovation in 2015. 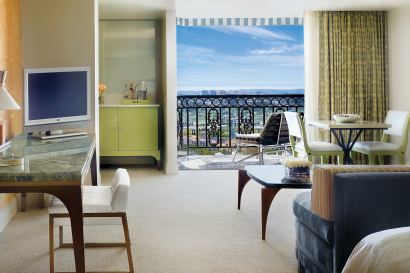 The renovation included adding 26 new luxury suites, including The Penthouse Inspired by Vivienne Westwood. A brand new fitness center, screening room, and press junket floor. 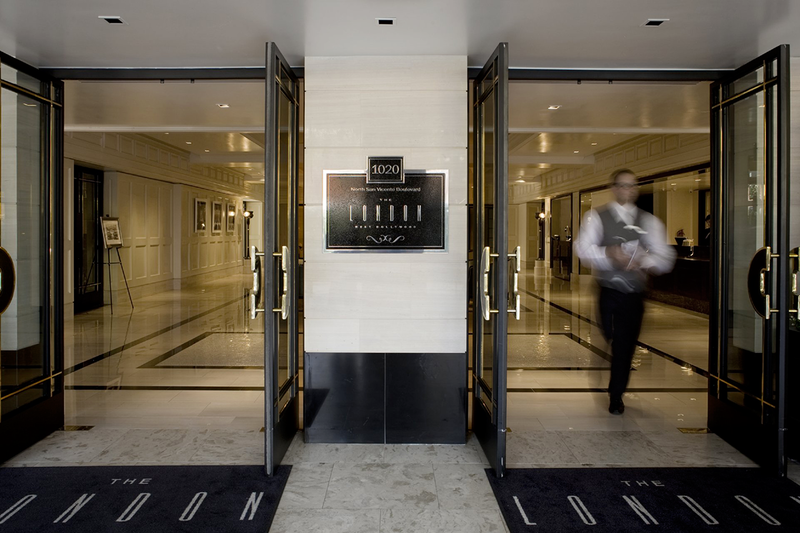 It is an all-suite modern luxury hotel that appeals to celebrities, families, couples, business and leisure travelers from all over the world. The hotel was built 30 years ago and was originally called The Belage. It was famous in the music industry and was built to feel like a luxury apartment building. The hotel is chic, but not stuffy, and guests love the rooftop pool, intuitive and friendly service, array of amenities and huge suites. Completion of USD$25 Million renovation in December 2015. 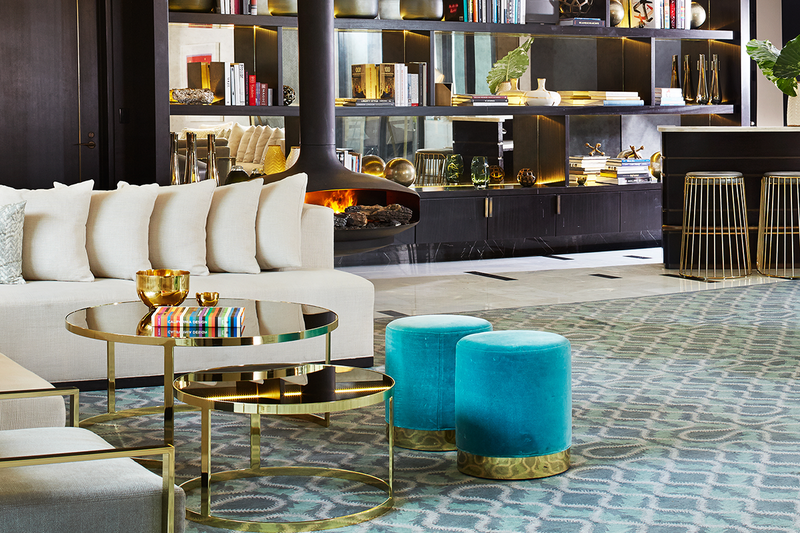 On boarding largest Penthouse in Los Angeles, inspired by Vivienne Westwood (1100 square meters). 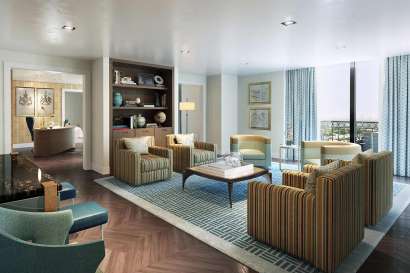 Renovation also included 3 Metropolitan Suites (ranging from 160 square meters to 300 square meters) designed by Richmond for David Collins designs. All suite hotel, the largest standard rooms in Beverly Hills or West Hollywood. 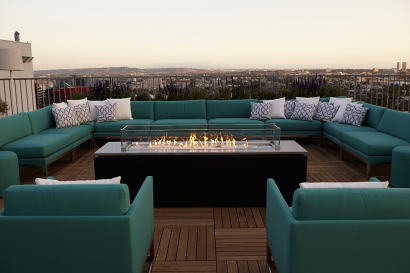 Complimentary Boxwood Breakfast Table and wifi, best rooftop pool in all of Los Angeles, inviting and warm service, delightful cuisine, and luxury suite collection. 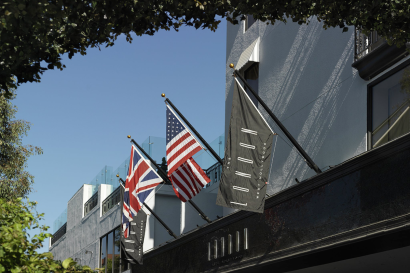 The location of the hotel is perfect in that guests take advantage of vibrant, walkable West Hollywood and is steps for all the shopping and attractions of Beverly Hills. West Hollywood on the Corners of North San Vicente Blvd and Sunset Blvd and the shoulder of Beverly Hills. Shopping : Rodeo Drive, Melrose Avenue, The Grove, The Beverly Center and Robertson Blvd. Sunset Strip for dining, comedy clubs and shopping. Runyon Park for hiking with 180’ views of Los Angeles. 200 restaurants and cafes in West Hollywood & all the dining in Beverly Hills. The largest Penthouse in all of Los Angeles. Best Rooftop Pool in the city voted by LA Magazine annually. The British Bulldog is the hotel mascot. 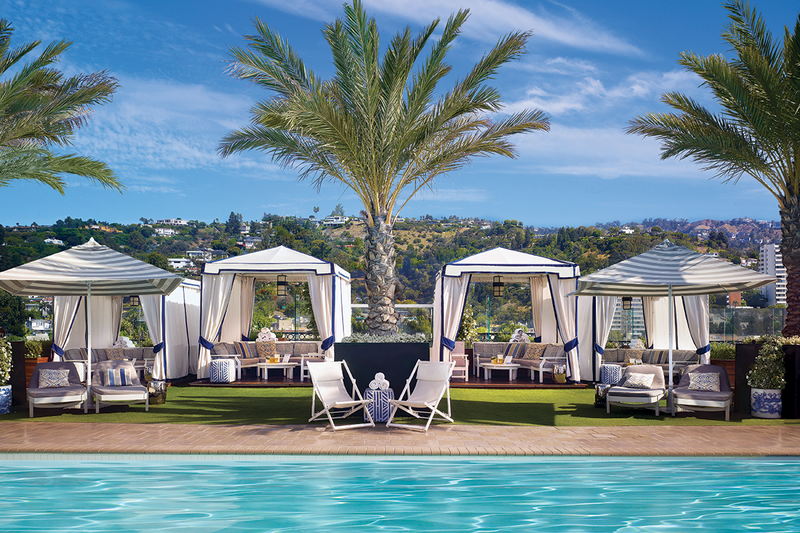 Largest standard rooms in West Hollywood or Beverly Hills. The concierge team give VIP gifts to the child guests and set up special in-suite amenities for children. Children enjoy swimming in the rooftop pool and the screening is available for families to rent. 226 Luxury Suites – All suites have private balconies or wrap around decks with Sunset Strip, City or Hillside views. Standard Suites lead in at 72 square meters. 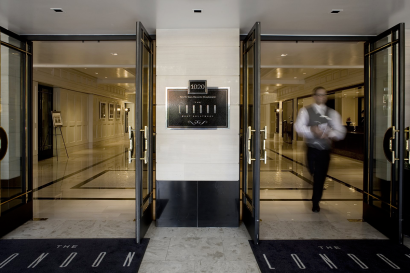 All rooms include daily complimentary European breakfast buffet for two people in Boxwood Restaurant, complimentary telephone calls to London landlines and WIFI throughout the hotel. 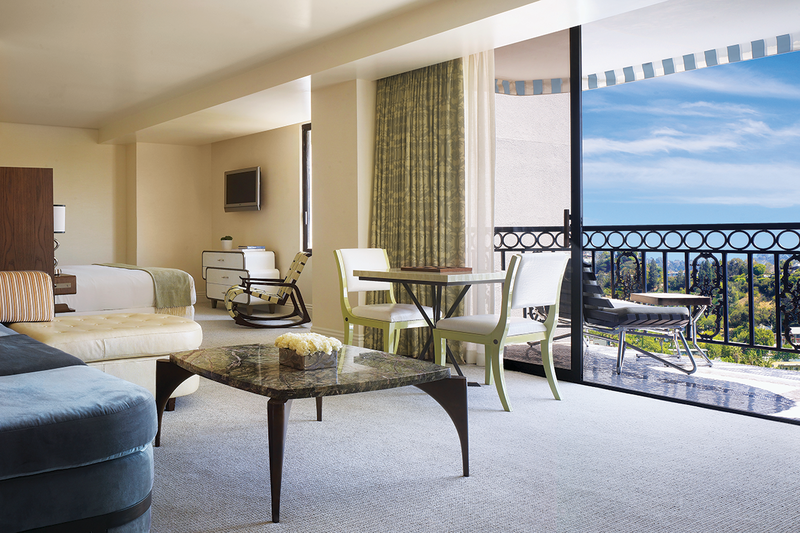 10 Premier Suites – Lead in starting at 140 square meters to 1100 square meters. 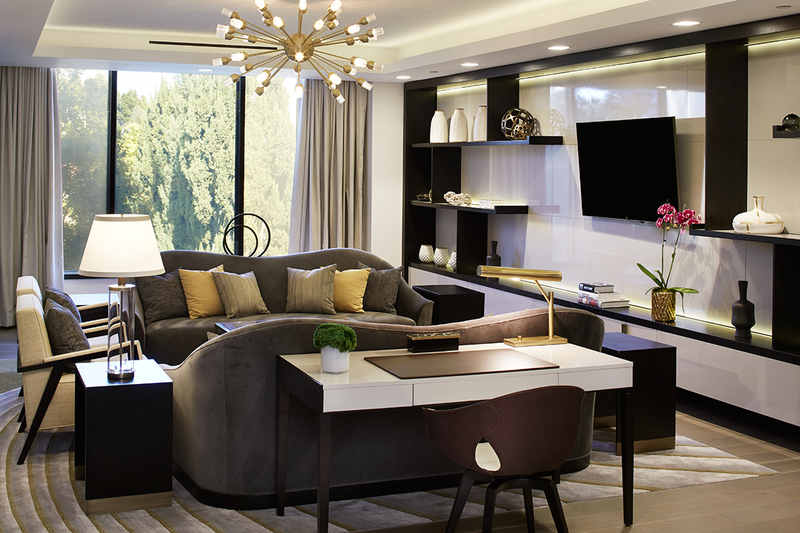 All Premier Suites come with kitchenettes or full kitchen in the Penthouse with private butler entrance. Includes roundtrip transportation to/from LAZ airport, daily complimentary European breakfast buffet, WIFI throughout the hotel, fresh cut flowers and complimentary telephone calls to London landlines. • Boxwood Restaurant and Rooftop West. 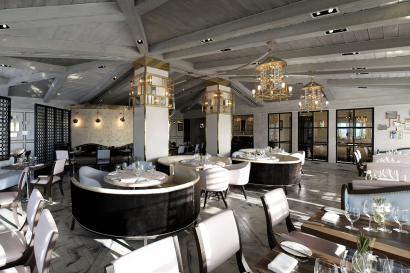 New American cuisine with British flair and influences. • All rates included complimentary breakfast buffet. 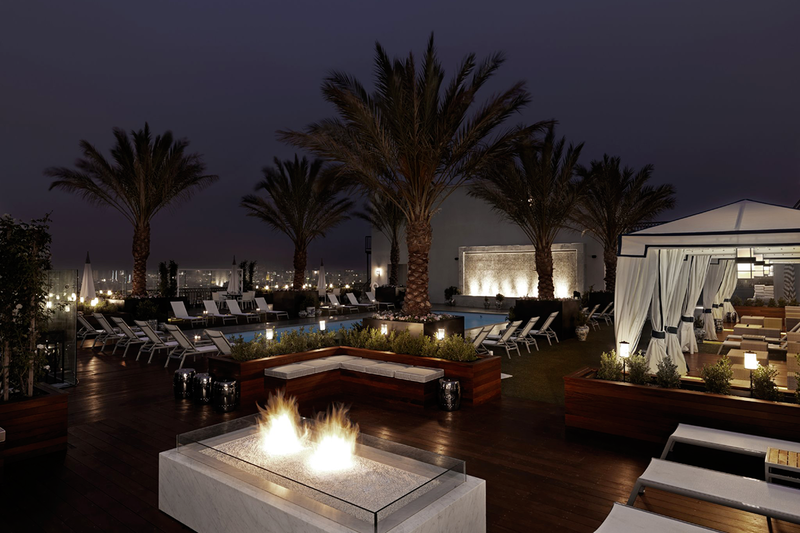 • Rooftop swimming pool with sweeping views and private cabanas. Brand new state of the art 300 square meters on main floor, complimented with bottled water, earbuds, towels and personal training is available upon request. • New Screening Room: 110 theatre seating. Brand new state of the art Screening Room with 100 seats.